The National Weather Service said the Missouri River at St. Joseph reached nearly 26 feet on Saturday, about a foot below what's considered major flooding at the northwest Missouri city. But it's expected to crest Wednesday or Thursday at 29.3 feet _ more than two feet above major flooding level. The flooding followed days of snow and rain _ record-setting, in some places _ that swept through the West and Midwest. The deluge pushed some waterways, including the Missouri River, to record levels in Nebraska, South Dakota, Iowa and Minnesota. 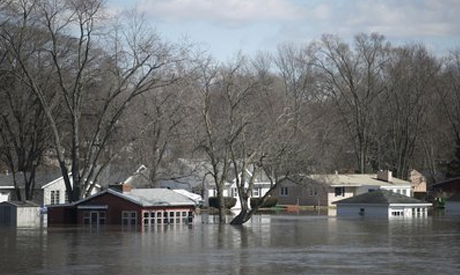 The flooding was the worst in nearly a decade in places. ``There is no way out of here unless you've got a helicopter _ or a boat,'' the Rev. Mike Bitter, pastor of Christian Church of Waterloo, told the Omaha World-Herald. ``What we're having now is the dress rehearsal for the main event that's going to happen in early April,'' he said of the flooding on the Mississippi. ``Within an hour of going to the store, I could not get back in. That's how fast the water was coming up,'' Martin said.